Brothers and sisters share a notorious relationship and while days can go by without talking, it is the love and well wishes for each other that takes up the heart. With Bhai Dooj around the corner, you might want to haunt a gift for each other that can be delivered within the same-day. With these siblings-inspired gifts and hamper, you can wave a goodbye to all fights and liven up Bhai Dooj day with prayers and exclusive gifts. The brother-sister bond may be mischievous and full of rivalry but what binds them together for the entire life is the love and care their heart hold for each other. Yes, no matter how much brothers and sisters fight, argue and irritate each other, their unconditional love for each other remains intact. Thus, to cherish the beautiful relationship of brothers and sisters, Bhai Dooj is an affectionate and wonderful way to celebrate the eternal bond. And since the sacred festival of Bhai Dooj is just around the corner, you should tell your sibling that your life is incomplete with him or her with a precious gift. However, if your brother or sister stays in a different city and cannot show up to you on this Bhai Dooj then, worry not because now even you can send your tokens of love to you siblings through FlowerAura’s Bhai Dooj express delivery of gifts. Yes, on this Bhai Dooj for brothers and sisters living miles apart from each other it won’t be difficult to convey their affection for each other. At FlowerAura, you can make use of our impeccable Bhai Dooj tikka delivery services and send Flowers, Gifts, Cakes, and even Sweets in just a few hours! No matter what part of the country your beloved brother is, you can send your love and your blessings to him even if you’re miles away. We truly believe that Love shouldn’t be affected by distance and that is why we make sure that we shrink the Miles and turn them to Smiles. So, if you’re wondering how to surprise your dear Brother with gifts and Bhai Dooj tikka, your search ends here. We understand how you enjoy spoiling him and here we promise to deliver Bhai Dooj gifts for brother through our same day delivery. All you need to do is choose from the delightful range of express delivery gifts for Bhai Dooj and be assured your blessings are going to find your Brother even if you can’t meet him. When it comes to finding a perfect gift to bring a perfect smile on your sibling’s face on the auspicious occasion of Bhai Dooj, FlowerAura provides the ultimate gifting solutions. We have an amazing collection of thoughtful products and combos designed with love that will strengthen your bond with your sibling. We have unique and creative gifts including classic mugs, personalised cushions, assorted chocolates, greeting cards, cakes and much more. For your doting brother, you can pick some of the best gifts like Brotherly affection, Traditional Bhai hampers, The best brother hampers, Super bro combo, Pyara Bhai gift hamper and much more. Our range of alluring and attractive Bhai Phota gifts for your brother is sure to convey your emotions for him in the most amazing manner. If you are looking for a special gift for your sister which would make your sister jump with joy then, browse through some of the best Bhai Dooj gifts for sister like ‘Her brilliance hamper’, ‘Unbound beauty’, ‘Nourishing beauty combo’, ‘Sweet token of love’, ‘Grand coffee hamper’, and much more. 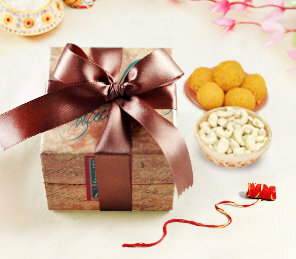 With our special Bhai Dooj today delivery, we take gifting a notch ahead. Now, you can choose a fabulous present for your sibling and send it to them only in a few hours! If you want to gift your sister or brother an everlasting memory then, you can avail our midnight delivery and send a gift to their doorstep right at the midnight. You can also avail next-day delivery with us and surprise your sibling in a mesmerizing way with a beautiful gift from us. Along with our impeccable and hassle-free delivery services, you can also enjoy a free shipping benefit with us. So, make the festival of Bhai Dooj a joyous one for your brother or sister by showing your adoration for him or her in a beautiful and ritualistic way.